The Custard TV: Is Saturday Night Entertainment Dead? Is Saturday Night Entertainment Dead? The announcement of BBC1's new Saturday night entertainment comedy puppet show The Puppet Game Show caused me to sigh in sheer despair. I know it's wrong to pre-judge a programme months before it appears on television but seriously, is a celebrity puppet show the best we can do on a Saturday night!? I know it's easy to say that things were better when we were younger but I'm almost certain they were. When I was a youngster, and not the fully grown adult I have since become Saturday was a great day for television. We'd wake up to kids TV like The Raccoons or Kissyfur interrupted by entertaining presenters and wacky competitions. We'd then race home in the evening to sit down in front of possibly the best Saturday night entertainment show ever Noel's House Party! You may snigger at Noel being the highlight of my Saturday night but he was. House Party was the best example of Family entertainment the young me had ever known. I know it got a lot of flack in it's later years but the thought of a trip to Crinkly Bottom was often what got me through a long week. There was an excitement about it that is lacking in anything we now consider to be a Saturday hit. Every week without fail the family would sit with our chocolate bars and wait for Noel and Blobby. We all had our favourite parts to the programme. I loved NTV in-which Noel would click his fingers and surprise an unsuspecting viewer in their lounge. 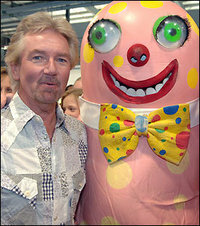 My sister liked Blobby, Mum liked Noel and my Dad (who pretended he wasn't watching) would take the occasional sneaky look over the top of his magazine to laugh quietly at the comedy performances when Noel's doorbell rang. True entertainment that the whole family can watch seems to be something we really can't crack anymore. The resurgence of Ant & Dec's brilliant series Saturday Night Takeaway proved that viewers still have a real hankering for fun on their Saturday night. The ratings for this year's series were phenomenal and it became a must see. I think even Ant & Dec wouldn't mind admitting that the format of the series borrows a bit from House party but it doesn't matter at all as Ant & Dec are great hosts and make fun and entertaining series. When the talent reality show broke through on Saturday Nights viewers were gripped again, but with series like The X Factor now in it's tenth series the love and affection for these sorts of shows are decreasing every year. The problem with shows like The Voice and X Factor is that we've become to used to them. We know every cliché, we expect every sob story, we expect the wacky no hopers who audition and now matter who they add to the panel the formats the the series don't allow for anything new or exciting to happen. I'll admit to raving here about series one of the BBC's talent effort The Voice but with hindsight I really don't think the BBC should be ploughing their time, and license fee payers money in a series with such a dull premise. The fact that the BBC can't give the winner the right publicity means that the records don't sell in the same way that Will Young's did on the first series of Pop Idol. This was proved recently when last year's winner of The Voice failed to make to the top 100 album chart. Controllers of all the major channels have often remarked on what a tricky night Saturday night is. I think they are on a constant hunt for the next big hit that we'll all be still be talking about come Monday morning but all too often they go for the easy route of another bog standard talent show filled with z list celebrities and below par talent. Don't get me wrong I've been sucked into The X Factor and I'll be watching the Britain's Got Talent Final but I think it is time we had a change and moved away from talent shows on a Saturday Night. I suppose, looking on the bright side the commissioning of this puppet show does show an attempt in moving forward and it remains to be seen how well it will do, but I fear it's not the a step in the right direction.